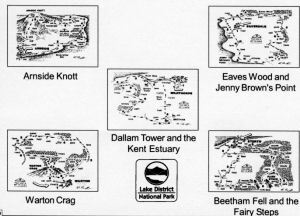 Lakeland Leisure Walks publish a series of walks around the Arnside and Silverdale areas. Known for its enchanting combination of native woodlands, peaceful meadows and shorelines the Arnside and Silverdale Area of Outstanding Natural Beauty is naturally sheltered and great for walking whatever the weather. Highlights such as Arnside Knott afford wonderful views towards the Lake District mountains and across Morecambe Bay. There are some great places to stop for refreshment in Silverdale and Arnside as well as at the RS[B reserve at Leighton Moss on the outskirts of Silverdale.